06-14-2012: MINNESOTA This was a tricky day but, initially, with a lot of promise. 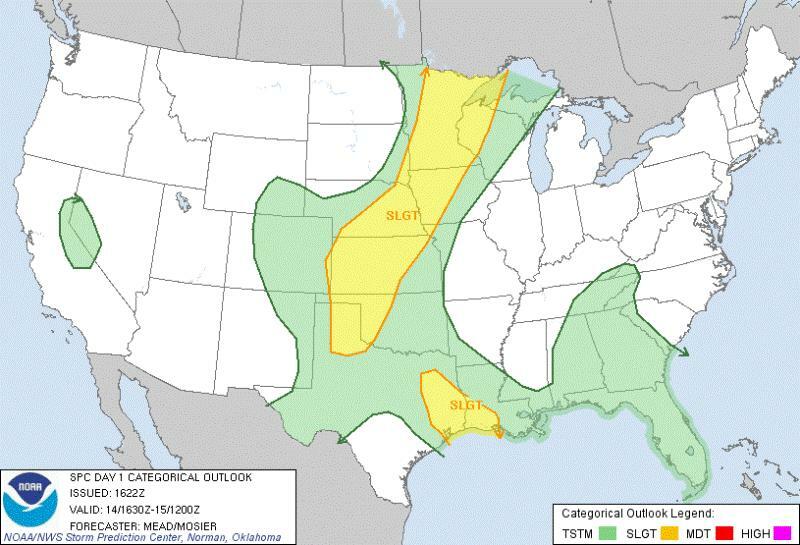 SPC had outlined a Slight Risk through much of MN with a 10% tornado risk from roughly Faribault through the Twin Cities and north to Hinckley. A complex of storms had rolled through the Twin Cities during the morning hours, producing a magnificent shelf cloud that I was able to view and take pictures of from my home in Burnsville. After the shelf went through, Jeff Buck and I went south on I-35 to get out ahead of the storm. 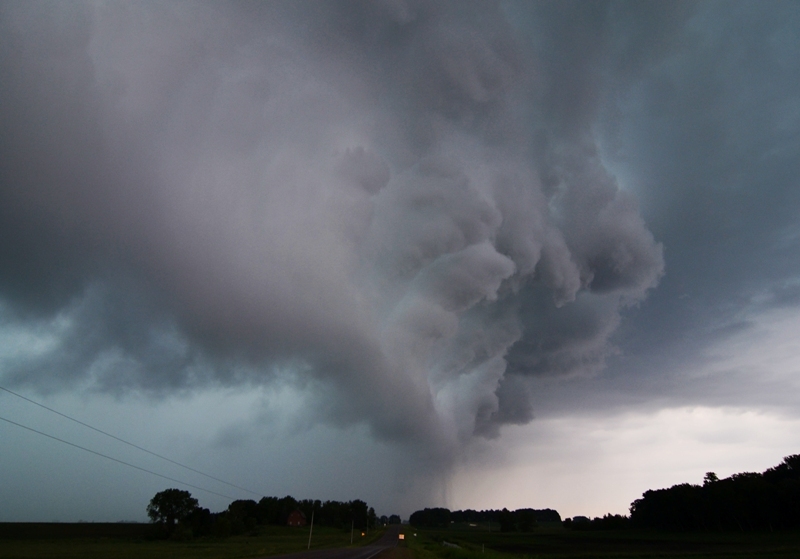 We progressed to Faribault as the gust front and outflow boundary began to stall and the shelf fell apart right in front of our eyes, so we turned around and headed back home. The thinking was that this outflow boundary would lift back north to the Twin Cities during the afternoon and we would be in good position at my house. There was a surface low developing in far northeast SD with a cold front draped south of there. The western part of the outflow boundary/warm front began to lift back north during the afternoon with the low, but persistent convection along the rest of the boundary allowed it to remain stalled through roughly Mankato over to just north of Rochester. This convection ended up being the caveat that limited the overall severe weather risk and essentially shut down any chance for tornadoes. We left my place and progressed down Hwy 169 and west on Hwy 19 to near Gaylord where we stopped to re-evaluate. A mesoscale discussion was issued by the SPC at 1:44pm for areas along and ahead of the surface low/cold front and near the western portion of the outflow boundary where the environment had become moderately unstable with 1500-2000 j/kg of MLCAPE and bulk shear of 40-55 kts. At 2:45pm, a severe thunderstorm watch was issued for counties right near and north of the outflow boundary, where storms were ongoing but becoming stronger as the instability increased and temperatures cooled aloft into the afternoon hours. The first storm we intercepted was just south of Gaylord on Hwy 22. This storm initially looked pretty good with an inflow tail and intense rain/hail core with echo tops over 40,000 ft. But this cell could never really get going and we ended up bailing and chasing after stronger storms to the east on Cty Hwy 8, then south on Hwy 112 out of Le Sueur and east on Hwy 99. These storms appeared to be going into a worse environment, but continued to strengthen after we stayed put northwest of Faribault. The storms looked really strong, almost supercell-like, on radar as they progressed over Hwy 52 and towards the MS River. These storms dropped considerable amounts of rainfall through the day that led to widespread flooding through this entire area as well as some hail and wind damage. After waiting around for 20 min, a new cell began to form and we went back west, viewing a shelf cloud moving over Mazaska Lake (picture below), and even an attempt at a base on a storm near the Hwy 99/Cty Rd 137 intersection. The storm that produced the base eventually puked out so we went back west to intercept another storm near Hwy 169 in St Peter. After taking a pit stop at the local dairy queen, we made a feeble attempt to chase back east on Hwy 99 all the way to I-35 to see if we could muster up anything else, but nothing all that interesting developing along the way so we headed back home. Overall, I think the clouds and persistent convection really kept things in check and weaker than anticipated on this day, and dewpoints never really got as high as forecast once again. I’m sure there were more reasons, but these were the glaring issues. 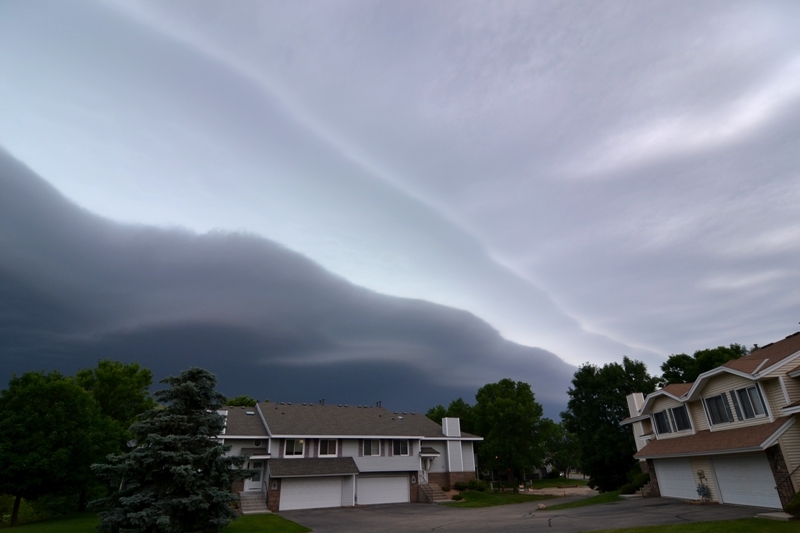 Awesome shelf cloud moving over my house in Burnsville, MN around 9am. Shelf cloud from across the street in the Byerly's parking lot. Strong core underneath developing storm southwest of Gaylord, MN. Shelf cloud moving across Mazaska Lake northwest of Faribault, MN. A weak attempt at a lowering, the only one of the day, southeast of Montgomery, MN on Hwy 99. Tried to punch this core heading north towards Montgomery, but it only had dime size at most when we went through. Rather intense shelf cloud with rapid rising motion on the forward flank near Le Center, MN.